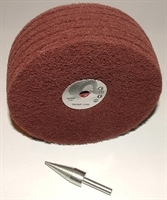 Tex, Scotchbrite type lap mops are available most commonly in 100mm (4") and 150mm (6") diameter and are used largely for satin finishing and graining of complex shapes where a flexible product is necessary. Most commonly they are used in a medium grade but can be supplied in any nonwoven Tex product. The layers (or laps) are joined around the centre leaving the outer edges flexible. We stock a range of lap mops (Click link below). Please contact us for a quote for other sizes/grades.